Now that summer is in full swing you will probably see a lot of salad or slaw recipes from me. When the temperature is hot outside I often do not feel like eating a heavy hot meal. Since I love salads I tend to make and eat them all summer long. There is also the added bonus of not needing to be in front of a hot stove for very long, or even at all. Even though I have an air conditioned kitchen now (thank G-d) I do remember many years where that was not the case. In the sweltering summer months you could not get me in front of the stove for an extended period of time, even if you paid me. I know there are plenty of people out there like that now. This is a really pretty and tasty dish. Because it does not have mayonnaise it transports well and is great for parties and picnics where it does not need to be refrigerated. It can be a side dish, lunch or even dinner with some shredded rotisserie chicken added in for protein. You can feel free to be creative with this recipe. It is really just a template. You can add whatever veggies you like and take out anything you do not like. My sister recently made this and added in a bell pepper and mushrooms. If you do not like olives, take them out. I use the tri color pasta because it looks pretty. 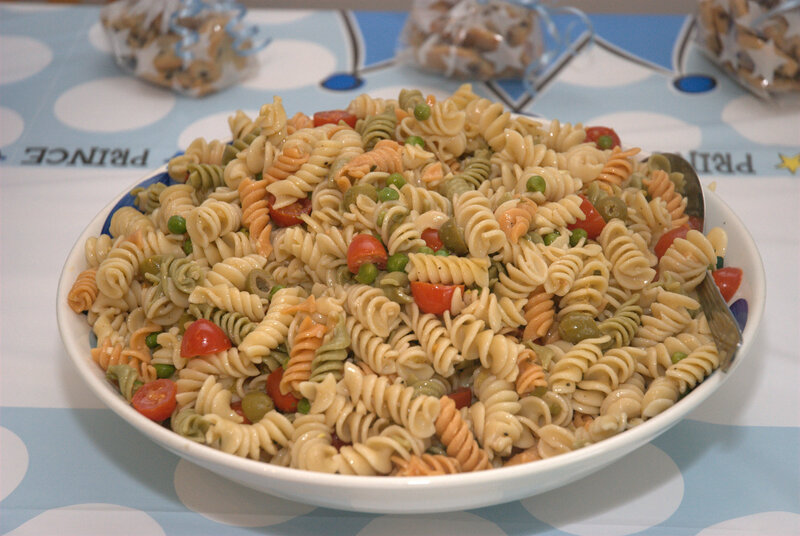 However, you could make this more healthful and use whole grain rotini instead. I made this earlier this year for my son’s first birthday party. It was a hit! 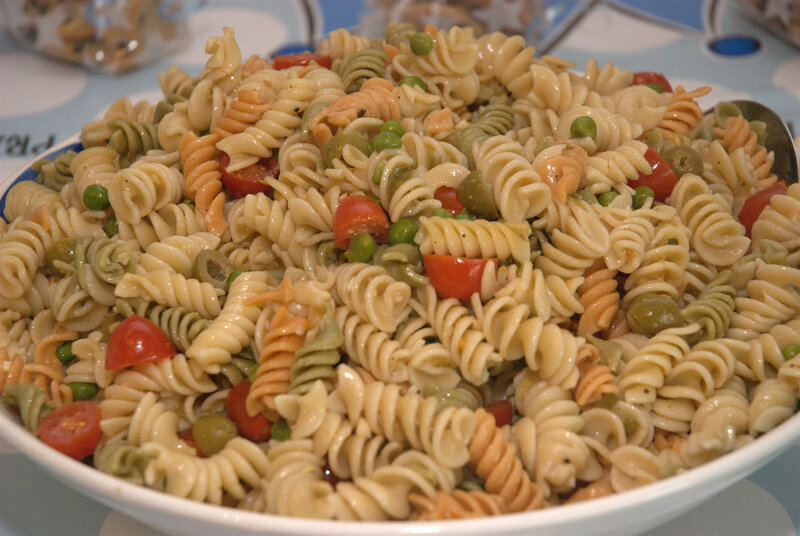 I know many people have a version of a pasta salad recipe. I like this one because it is easy and tastes great! While the pasta is cooking chop your vegetables and olives. Place the vegetables in a large bowl. Drain the pasta and allow to cool. To make the dressing, place the vinegar, scallions, mustard, salt and pepper in a separate bowl. Whisk until all the ingredients are well incorporated. Stream in the extra virgin olive oil while whisking vigorously until you have a dressing consistency. Once the pasta is cool add it to the large bowl of vegetables and pour the dressing over everything. Toss to combine all the ingredients. Can be served cold or at room temperature. this sounds easy – and that makes a choice for me! It is easy and very favorful. My two favorite things when it comes to cooking! Celery and peas are my least favorite things so I replaced them with mushrooms and a yellow pepper and it was really easy and delicious! Now this is my kind of salad. Love the addition of Peas! So glad you found the blog – hope you enjoy it!